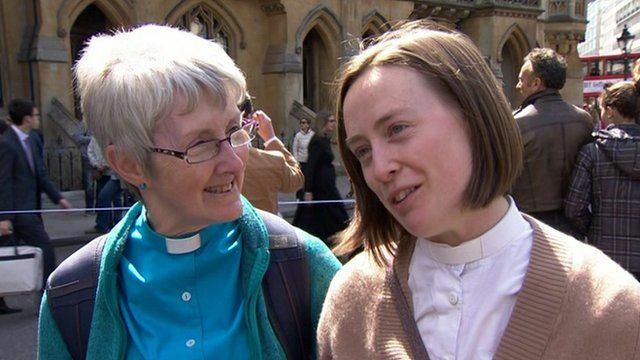 'A day to celebrate an amazing job' Jump to media player Women priests have celebrated 20 years since the first ordination of a woman in the Church of England. Women priests march through London Jump to media player A procession through London has been held to celebrate 20 years since the first women were ordained as priests in the Church of England. Synod to vote on women bishops Jump to media player The Church of England's governing general synod is due to vote on whether to allow women to become bishops. Synod debates women bishops issue Jump to media player The Church of England's ruling synod is meeting in York ahead of a planned vote on whether to allow women bishops. Women priests have celebrated 20 years since the first ordination of a woman in the Church of England. More than 1,000 women priests were expected to march through London from Westminster Abbey to St Paul's Cathedral. Mother and daughter Helen and Susie Thorp - both priests - told the BBC's Robert Pigott that it was a "day to celebrate an amazing job".